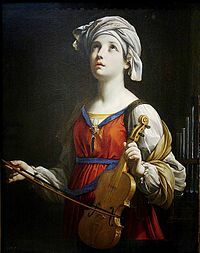 St Cecilia was a noble lady of Rome. She was martyred, together with her husband, her brother and a Roman soldier, for her Christian beliefs and practices. St Cecilia was a talented musician and vocalist, it is often said that on her wedding day she, “Sang in her heart to Our Lord Jesus”. There are many romantic stories about St Cecilia and modern day musicians have compiled numerous songs in her name. Legend holds that having been struck by a sword at her martyrdom, she remained alive for a further three days. Her Feast Day is celebrated worldwide and is associated with festivals and musical celebrations including many liturgies. In 1599, St Cecilia’s body was discovered to be incorrupt. She is the Patron Saint of musicians. Her Feast Day is the 22nd November. As His fair praise, we sing!